In honour of the amazing accomplishments achieved by Felix Baumgratner, Zenith has introduced one of the most gorgeous wristwatches to come from the crazy cats at Zenith. However before we get into the nitty gritty of the timepiece, it’s only fitting to list some of the achievements that has made Felix Baumgratner such a household name. A former Austrian army paratrooper, he was never a stranger to challenge and his record attests to this. From parachute jumping off the Petronas tower in Kuala Lumpor in 1999 to leaping off the 91st floor of the Taipei 101 skyscraper in Taiwan in 2007, his records and his no limits attitude is what makes him such a unique figure in history. But how does this relate to Zenith? Well on October 14th 2012, with Zenith as a companion, he broke not 1 but 3 freefall records, the first height, the second speed and the third duration. An extreme athlete who Zenith are honouring with one amazing timepiece. With that in mind let’s get to the good stuff! Like all Zenith models in this line, the Christophe Colomb Tribute to Felix Baumgartner definitely stands out on its own with an amazing dial construction and use of bold colour. The first thing that draws your eyes is the figure in a space suit that is used to represent Felix on his jump back to earth after having reached maximum height. The figure is used as an adornment for the power reserve indicator at 3 o’clock and is chased and engraved on a hand-polished 18ct gold plate fixed to the dial by 2 screws. Another great little homage to Felix is the use of a small dial that is incorporated into the hours and minutes dial at 12 o’clock. If you look carefully you can see a small white line between 12 o’clock and the first hour marker that is used to incorporate the time taken for the jump (4 minutes and 20 seconds). Finally, and for me the standout feature of the dial is the turquoise Earth filling a large portion of the face with the Milky Way depicted on the upper sphere of the face. 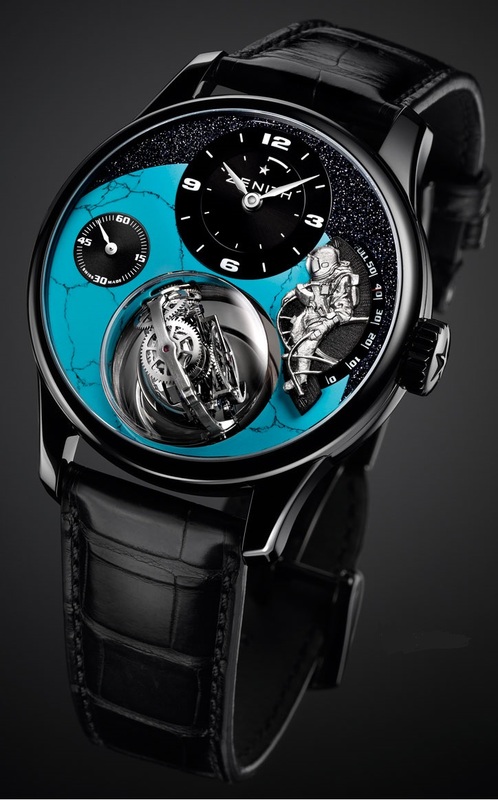 Lastly, as with all models in this line, the timepiece houses an open gyroscopic gravity control module at 6 o’clock. Working away underneath this beautiful face is the ICONIC El-Primero 8804, manual winding movement featuring 2 horological feats dedicated to the precision: firstly a regulating organ with a high oscillation frequency of 36,000 vibrations per hour serving to divide the time into tenths of a seond; and a micromechanical marvel in the shape of a patented Gravity Control gyroscope module, which neutralises the effects of gravity on the rate of the watch. The Gravity Control module picks up the same principle in miniature form enabling the escapement to remain in constant horizontal position whatever position your wrist is in. The watch measures in at a hefty 45mm in diameter and finished in platinum with a diamond-like carbon coating that gives the matte black material a beautiful finish with extreme hardness and scratch resistance. The caseback is also finished in the same precision and execution with a beautiful hand engraving inscription indicating the 3 records broken by Felix.